The carpet texture retention warranty usually covers excessive loss of texture from foot traffic resulting in tuft bursting, opening or loss of twist which cannot be corrected. 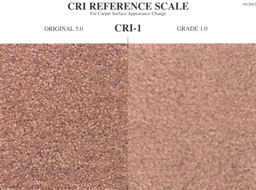 Under the terms of the carpet texture retention warranty the manufacturer will often have a certified carpet inspector rate the carpet using the CRI texture retention rating scale. These standardized rating scales have a range, 5 = No change, 4 = Slight change, 3 = Noticeable change, 2 = Considerable change, 1 = Severe change (A grading with a decimal indicates that the appearance fell between two grading scales.The accepted change under the terms of the carpet texture retention warranty will often be 3.0 to 3.5. It is considered a normal characteristic for the texture of any carpet to change over time. Texture retention is the ability of carpet’s tufts to retain their visible shape, as measured by the degree of bursting, opening, or untwisting of the tufts at the surface of the carpet. Vacuum marks or heavy wheeled devices. Damage from such things as tears, pulls, cuts, burns, pets, furniture coasters, athletic equipment, athletic foot wear, vacuum marks or heavy wheeled devices. Changes in appearance caused by soiling or furniture depressions. The carpet must be properly installed. Carpet and Rug Institute (CRI 104 & 105) are routinely referred to. Article modified from Carpet Inspectors Handbook by Terry and Kevin Weinheimer. Sorry to hear of your problem. If the companies will not work with you, you can certainly hire your own inspector. Generally fuzzing of carpet during spot removal is caused by excessive scrubbing instead of blotting or using extraction. Without examining the carpet a fiber problem cannot be ruled out. As far as the 3.0 rating, they are referring to the ISO/CRI texture change rating a number that relates to the allowable amount of texture change. What did Lowe’s tell you regarding the 90 day satisfaction guarantee? As far a legal advice, you would need to speak with an attorney.